The award from the National Institute of General Medical Sciences (NIH/NIGMS) of approximately $10.6 million is aimed at developing the second phase of the Puerto Rico Center for Neuroplasticity, a Center of Biomedical Research Excellence (COBRE) lead by Drs. José A. Lasalde Dominicci (UPR-RP, Biology) and Mark Miller (UPR-RCM, Institute of Neurobiology). 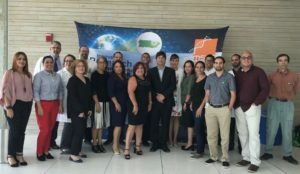 The Puerto Rico Center for Neuroplasticity at the University of Puerto Rico is a collaborative effort between researchers from the Medical Sciences Campus and the Department of Biology at the Rio Piedras Campus, and is focused on understanding a wide array of neurobiological problems including deciphering the neural circuits that control behavior, the origins of neural and mental health disorders such as autism, PTSD and dementia, as well as elucidating the molecular basis for alcohol neuroadaptation and addiction. The lead researchers involved in this second phase of the research center are: Dr. Alfredo Ghezzi (UPR-RP, Biology), Dr. Demetrio Sierra (UPR-RCM, Anatomy and Neurobiology), Dr. José Colon-Saez (UPR-RCM, Pharmacy), Dr. Bruno Marie, Dra. Amaya Miquelajauregui, Dra. Cristina Velázquez, and Dr. Andrew M. Seeds (UPR-RCM, Institute of Neurobiology). This NIH-COBRE award will not only provide a significantly boost to the research infrastructure of the University of Puerto Rico but will also impact biomedical investigation throughout the island.